This is a pretty clean and simple card. 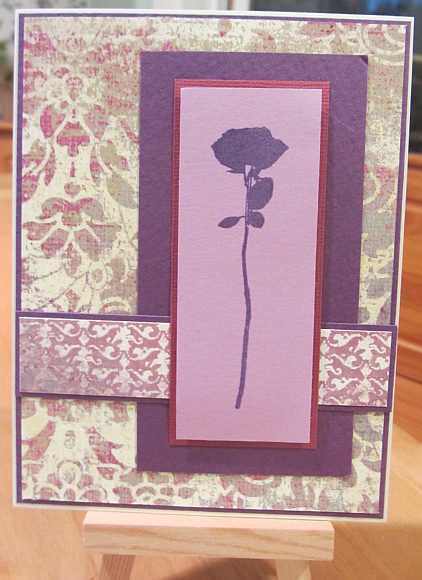 I really feel that the rose silhouette stamp is beautiful and strong enough to stand alone with the muted tones of the patterned papers as a backdrop. I really enjoyed this sketch, the first I’ve used from Freshly Made Sketches–this is Freshly Made Sketch #42. Thanks for stopping by today and I hope to see you soon. This entry was posted on Sunday, July 8th, 2012 at 10:12 pm	and tagged with clean and simple stamping, flora, stamping and posted in Freshly Made, General Cards. You can follow any responses to this entry through the RSS 2.0 feed. Hi Yvonne! You are right, that rose image is prefect as is and works beautifully with the patterned papers you chose. Thanks for playing with us at Freshly Made Sketches! What a lovely card! That rose is a beautiful image! Such wonderful colours as well! Thanks for joining us this week at Freshly Made Sketches! This is such a pretty card. I love the DSP and colors! Thanks for sharing with us at Freshly Made Sketches this week! Love the pattern papers and the color scheme you have chosen. Thanks for playing with us at Freshly Made Sketches!